No matter how they start out, container drawers always get crazy after a while. Every now and then you just have to make the time to go back, match the lids, and reset those container drawers. Here we have two container drawers. On the left, large containers. On the right, smaller containers. The first thing that needed to happen: everything out. There were some lids wedged back in behind the drawers and with everything out of the drawers, I was able to do a nice wipe down to clean them from fallen crumbs and dust. 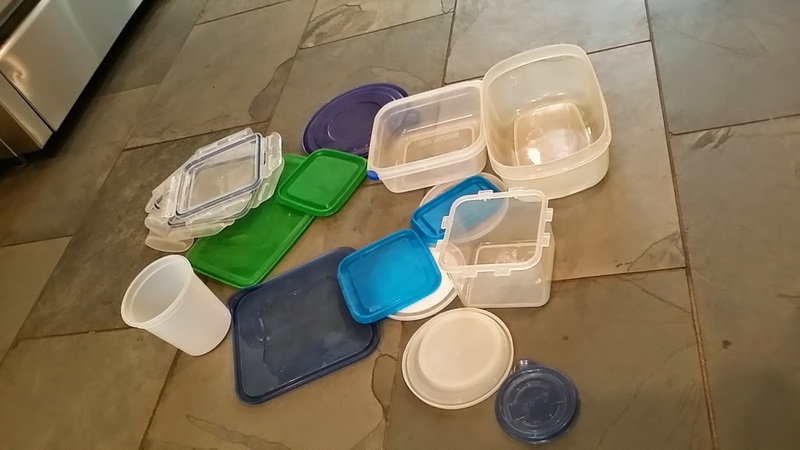 I then matched all of the lids with containers and stacked them by size. These were the poor lonely pieces with no partners. Take-out containers! Just looking at these things makes me want some hot and sour soup! I’m sure we all have our share of these guys, I mean, the lids fit so snug! I kept 5 of each size (with lids) and recycled the rest. Then, I made my way over to the small drawer. I nested the smaller bowls inside of the larger ones, and stacked the lids accordingly underneath of the nest. That way, the lids are always with the corresponding bowl! I even used one of the leftover, no-lid bowls to house the travel silverware. Those extra no-lid bowls also work really well for small containing in office, tool, and junk drawers! Check-out the small containers before and after! Previous Previous post: Spring Cleaning! Donate, donate, donate!